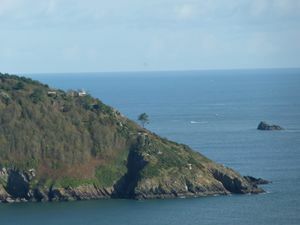 NCI Froward Point is a busy National Coastwatch Institution (NCI) lookout station at Froward Point at the easterly side of the mouth of the River Dart two miles from Kingswear in Devon in England. Its twin duties are to maintain an hours of daylight watch over the local coastal area and the South West Coast Path on whose route it lies. With some significant blind spots because of the coastline, NCI Froward Point covers the coastline from Start Point in the West towards Brixham in the East. The area of operation has a mixed boating population of a fishing fleet, recreational yachtsmen, both sail and power, yacht racing fleets, small commercial passenger vessels, kayaks, canoes, military vessels, dinghy racing fleets, racing gigs, small boats and inflatables, powered and unpowered. During the summer months the recreational seafarers make the lookout both busy and an important resource. In addition there are regular visits to the River Dart by passenger cruise liners during the cruising months. The high number of boating movements makes the mouth of the Dart and the surrounding headlands places of high risk. While not involved in traffic management, NCI Froward Point alerts Brixham Coastguard both to potential incidents and incidents in progress. The Froward Point lookout became operational in July 2005 with planning going back to 2002. It is one of a growing number of NCI lookout stations on the coast of the United Kingdom. NCI Froward Point rents two buildings of the Brownstone Battery complex, a World War 2 battery, from the National Trust. As a part of the NCI UK registered charity, NCI Froward point is entirely supported by charitable donations. The station is equipped with fixed and handheld VHF radios, a pair of mounted telescopes, binoculars, a radar set and a weather station. The weather station updates the lookout's website with weather data every minute or so via a microwave link to a broadband connection as an important real time service to seafarers. A webcam, updating images at the same interval, provides a visual check on sea state and weather. With no mains electricity to the site solar panels are used and a diesel generator is run when necessary. The lookout station maintains a visitor centre with information about both its operations and also the Brownstone Battery itself. When not monitoring the surrounding area for people at risk, watch keepers record sightings of seals, cetaceans and other wildlife for relevant wildlife organisations. 13 Sep 2007 - Asked to assist Brixham Coastguard in locating disabled motor cruiser Jelly Bean. Located successfully. 27 Sep 2007 - Assisted Brixham Coastguard with locating MFV Jose Jacqueline, reported to be in danger. 21 August 2007 - Assisted Brixham Coastguard with yacht Stay Free taking in water. 20 June 2009 - Asked to assist Brixham Coastguard with a 19 ft Dory with 5 on board, that had run out of fuel at the Homestone and had let off flares. 29 August 2009 - Initiated rescue of replica of Nelson's cutter. 4 May 2010 - Initiated alert for apparently unmanned drifting motor cruiser south of Mewstone. 27 April 2011 - Initiated ambulance assistance for walker in difficulties on the coast path. 3 August 2011 – Initiated assistance for dinghy on lee shore in Newfoundland Cove. 20 July 2013 - worked with Brixham Coastguard and NCI Prawle point to identify missing vessel suspected of being in difficulties off Start Point. ↑ Rainsley, Mark (4 April 2008). South West Sea Kayaking. Pesda Press. p. 79. ISBN 978-1906095055. http://books.google.com/books?id=NW2gJ0MAz_kC&pg=PA79&dq=%22Froward+Point%22+-inpublisher:icon&hl=en&ei=cnYFTfG8JueL4gakx62NCg&sa=X&oi=book_result&ct=result&resnum=7&ved=0CEIQ6AEwBjgU#v=onepage&q=%22Froward%20Point%22%20-inpublisher%3Aicon&f=false. Retrieved 13 December 2010. ↑ "Minutes of the Annual Assembly of the Parish Meeting". Kingswear Parish Council. 5 May 2009. http://www.kingswear-devon.co.uk/APM.htm. Retrieved 17 December 2010. "Bob Tozer, Station Manager reported: I have some 70 watch keepers, all volunteers working ‘daylight’ hours each day of the year. Our normal day in the winter is from 1000 to 1600 and in the summer form 0900 to 17400. During June, July, August and September we try to cover as many evenings as possible. i.e. from 1700 to 2000. In all some 2400hrs of time watch keeping." ↑ Blackford, Dennis. "Kingswear Castle Cove - Coleton Fishacre - Scabbacombe Head". WalkingWorld.com. http://walks.walkingworld.com/View/610/Walk.aspx. Retrieved 12 December 2010. "The route takes the walker through the more modern and extensive World War Two complex at Froward Point." ↑ "brixham coastwatch lookout". SouthWestBusiness.co.uk. 25 February 2009. http://www.southwestbusiness.co.uk/news/Death-warning-coastwatch-lookout/article-725240-detail/article.html. Retrieved 12 December 2010. ""You cannot see Berry Head from Froward Point or Daddyhole Plain, there's this horrible gap," [Beldham] said at the recent Brixham Community Partnership meeting." ↑ "Dart Harbour : DHNA Visiting Ships - Find out more about forthcoming ship visits here". Dart Harbour & Navigation Authority. http://www.dartharbour.org/visiting-ships/. Retrieved 17 December 2010. ↑ Bygrave, Mike (October 2006). "New NCI lookout.". Yachting & Boating World (IPC Media). http://www.ybw-directory.com/reprints/results_related.jsp?tem=ybw&id=50379&offset=0. Retrieved 13 December 2010. "New National Coastwatch Institution lookout on former gun battery site at Froward Point"
↑ Taylor, Hannah (4 March 2009). "Watch station founder stands down". Express & Echo (This Is Exeter). http://www.thisisexeter.co.uk/news/Watch-station-founder-stands/article-743967-detail/article.html. Retrieved 13 December 2010. "Mike Povey has been station manager at the lookout, east of the Dart estuary, since it was established in 2005. Mr Povey said in his final speech to National Coastwatch Institution members at the Royal Dart Yacht Club that starting up the Froward Point station has been a massive job." ↑ "Team history". Froward Point National Coastwatch Institution (NCI). http://www.nci-frowardpoint.org.uk/teamhist.htm. Retrieved 12 December 2010. "2002: The desirability of a Coastwatch station at Froward Point is established, and the WW2 Battery Observation Post identified as a suitable base. Discussions with the National Trust start.... July 2005: First logged watch." ↑ "Heritage, Landscape & Wildlife: Kingswear to Froward Point". South Devon AONB. http://www.southdevonaonb.org.uk/text.asp?PageId=209. Retrieved 12 December 2010. "The National Coastwatch Institute station is situated at Brownstone Battery. Visitors are welcome to pop-in and say hello at the lookout and to peruse the display house opposite." ↑ "Regatta's £400 for Coastwatch". The Herald (Plymouth). 31 October 2009. http://beta.thisisplymouth.co.uk/news/Regatta-s-163-400-Coastwatch/article-1470138-detail/article.html. Retrieved 12 December 2010. "Volunteer watchkeepers at Froward Point, Kingswear, have benefited from a £400 donation from the village's annual regatta.... Funded entirely by voluntary contributions, Forward Point is sited to the east of the Dart estuary — about 45 minutes' walk from Kingswear." ↑ "Totnes Information Centre - Events - Brixham Orpheus Male Voice Choir". Totnes Information Centre. http://www.totnesinformation.co.uk/events/1300/brixham-orpheus-male-voice-choir. Retrieved 13 December 2010. "Saturday March 27th 2010: Charity conacert in aid of Froward point (Kingswear) coastwatch station. (sic)"
↑ Rowing (7 May 2010). "Entries sought for Kingswear Regatta". Herald Express (This Is South Devon). http://www.thisissouthdevon.co.uk/news/Entries-sought-Kingswear-Regatta/article-2126659-detail/article.html. Retrieved 13 December 2010. "Kingswear Regatta made one of the first major donations to the Dartmouth Inshore Lifeboat Appeal in 2002 – and have subsequently supported other local charities including Devon Air Ambulance, the Froward Point Coast Watch project, Kingswear Rowing Club, Cancer Research, The Friends of St Thomas' Church Kingswear, Dart Sailability, Kingswear Community Primary School, Kingswear Village Hall and the Port of Dartmouth Royal Regatta. All of these are local charities and this is the heart of the this local regatta's ethos." ↑ "Keeping watch for sailors' safety Kingswear's National Coastwatch Institution Station at Froward Point at the mouth of the River Dart was recently successfully assessed for Declared Facility Status (DFS).". Herald Express (Torquay UK) (Herald Express (Torquay UK)). 25 October 2007. http://www.highbeam.com/doc/1P2-14582040.html. Retrieved 12 December 2010. "The assessment took place over a whole day when members of the national DFS team examined various documentation including station records, training manuals and procedures, and also set tasks for five watch keepers, this being 10 per cent of the total number qualified at the present time." ↑ "Dart Harbour : Radio Communication". Dart Harbour & Navigation Authority. http://www.dartharbour.org/harbour-river-guide/radio-communication/. Retrieved 13 December 2010. "The National Coastwatch Institution (NCI) lookouts at Prawle Point and Froward Point maintain a visual and listening watch on VHF channel 16 during daylight hours." ↑ "South Devon storm warnings". Herald Express (This Is South Devon). 14 November 2009. http://www.thisissouthdevon.co.uk/news/South-Devon-storm-warnings/article-1515356-detail/article.html. Retrieved 12 December 2010. "The National Coastwatch weather station at Froward Point near Kingswear reported gusts of up to 75mph at around 10am, with constant winds of 'strong gale' force according to the Beaufort Scale, and gusts reaching 'violent storm'." ↑ "Parish of Stoke Fleming -- Links". Parish of Stoke Fleming. http://www.stokefleming.org.uk/links.htm. Retrieved 17 December 2010. "National Coastwatch Institution's station at Froward Point looking towards Start Bay and Stoke Fleming Live weather and webcam"
↑ "Higher Brownstone to Froward Point - a short walk using the South West Coast Path". South West Coast Path. http://www.southwestcoastpath.com/main/walks/index.cfm?fsa=dspWalkDetail&w_id=76. Retrieved 17 December 2010. "A National Coastwatch Institute station is now situated at the Battery and has fine views across Start Bay. Visitors are welcome to pop in and say hello at the lookout and to peruse the display in the building opposite." ↑ "Local Content". Devon County Council. http://portalstaging.devonline.gov.uk/staging/localcontent.htm?site=5&ref=walk64.htm&. Retrieved 17 December 2010. "The National Coastwatch Institution has a visitor centre here with local information. This is also where the short cut past the Daymark arrives at the coast." ↑ 20.00 20.01 20.02 20.03 20.04 20.05 20.06 20.07 20.08 20.09 20.10 20.11 "Froward Point National Coastwatch Institution (NCI)". NCI Froward Point. http://www.nci-frowardpoint.org.uk/news_pre2012.html. Retrieved 17 December 2010. ↑ "Incidents January 2006". HM Coastguard. http://www.torbaycoastguard.co.uk/call_out_pages/2007/call_outs_aug07.html. Retrieved 17 December 2010. "Berry Head Coastguard, Fishing Vessel Our Joel and Yacht Clarrissa proceeded and Froward Point National Coastwatch made observation, to report of Flashing Light from Red Sailed Yacht taking water off St Mary’s Bay, Berry Head. Junk-rigged Yacht STAY FREE responded safe and well heading into the River Dart." ↑ "United Kingdom Government News: Man rescued from river Dart by fishing vessel". 24 November 2007. http://www.gov-news.org/gov/uk/news/man_rescued_from_river_dart_by_fishing_vessel/43652.html. Retrieved 17 December 2010. "Dave Scullion, Brixham Coastguard Watch Manager says: 'This man was very lucky as the impact had caused him to lose consciousness, he had lost his helmet and his lifejacket had been damaged and had the effect of pushing him under. He had very quickly become hypothermic and was transferred by the lifeboat to the hospital at Dartmouth for treatment.'" ↑ "Dartmouth Lifeboat: Launches; 24 November 2007". RNLI. 24 November 2007. http://www.dartmouth-lifeboat.org.uk/Launches.html. Retrieved 17 December 2010. "The circling boat was observed by the volunteers at the National Coastwatch lookout at Froward Point who pinpointed the casualty some one hundred metres from his boat and alerted the Coast Guard. The Coast Guard called out the ILB and also called all vessels in the Dartmouth area. The Fishing boat Deborah Jane responded and had just picked up the casualty as the ILB arrived. A crewman from the ILB was placed on the Catamaran and she and the casualty were brought back to port. The casualty was transferred to Dartmouth Hospital." ↑ June 2009 "Dartmouth LIfeboat: Launches: 20 June 2009". RNLI. http://www.dartmouth-20 June 2009. Retrieved 17 December 2010. "The Coastguard requested attendance to a 19ft Dory with 5 on board, that had run out of fuel at the Homestone and had let off flares. The dive-boat Falcon, skippered by Tony Hoile, an ex DLA, reached the boat first and took them in tow. The incident was observed and monitored by the National Coastwatch team at Froward point." ↑ Peacock, Steve (29 August 2009). "Regatta rowing crew rescued in high winds". Herald Exprerss (This Is South Devon). http://www.thisissouthdevon.co.uk/news/Regatta-rowing-crew-rescued-high-winds/article-1294528-detail/article.html. Retrieved 12 December 2010. "The cutter, a two-masted replica from Lord Nelson's famous ship HMS Victory and with seven people on board, came within 20 feet of disaster. It was being driven on to the Mew Stone rock off Froward Point after it was caught out by heavy seas and strong winds. Froward Point National Coastwatch Institution's lookout, which overlooks the mouth of the River Dart, spotted the vessel in danger and raised the alarm around 11am"
↑ "Dartmouth Lifeboat: Launches: Tuesday 4 May 2010". RNLI. 4 May 2010. http://www.dartmouth-lifeboat.org.uk/Launches.html. Retrieved 17 December 2010. "The National Coastwatch observers at Froward Point had been observing a motor launch drifting south of the Mewstone for 20 minutes without any sign of a crew. They informed the Coastguard who requested the ILB to launch to investigate." ↑ "Dinghy trapped by onshore winds". Dart Lifeboat - RNLI. 3 August 2011. http://www.dartlifeboat.org.uk/launches/show/128. Retrieved 4 August 2011. "The National Coastwatch team at Froward Point reported that a dinghy with 3 adults and 2 children on board was having difficulty leaving Newfoundland Cove due to the onshore wind and their engine would not start." ↑ "Coastwatch and Coastguard Teamwork identifies vessel reported missing". 21 July 2013. http://dartmouthboat.co.uk/yesterday-in-my-nci-coastwatch-afternoon-watch/. Retrieved 21 July 2013. "During the afternoon of Saturday 20 July 2013, on a fine day with a moderate easterly wind, the duty watchkeepers at Froward Point were contacted by their colleagues at Prawle Point and asked to keep a look out for a dory with a single person on board which they had lost sight of in the tide race off Start Point, and had presumed to be in difficulty." This page was last edited on 21 July 2013, at 13:30.